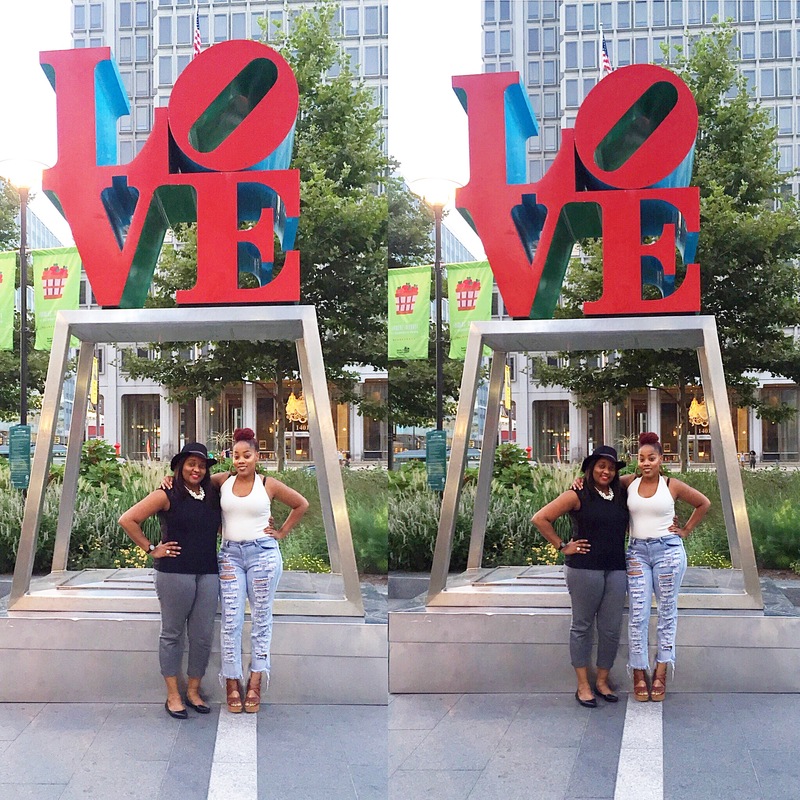 Philadelphia, PA- This past weekend I visited my friend of over 10 years in Philly, we met in college at Hampton University where we both later transferred and finished our degrees at alternative universities. I was from New Jersey and she was from Chicago. With the power of social media we kept in touch over the years. 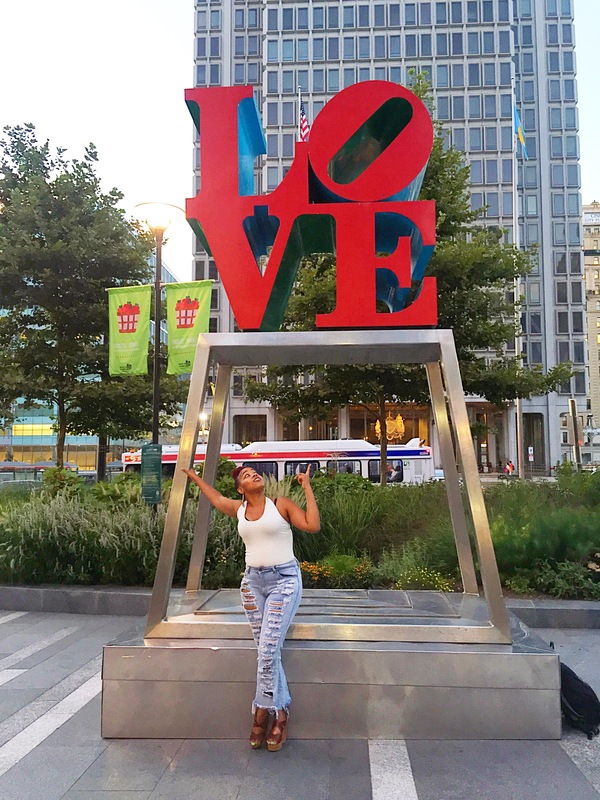 While I was there we had enough time to visit the LOVE sculpture at Love Park down town Philadelphia which is a huge tourist attraction. 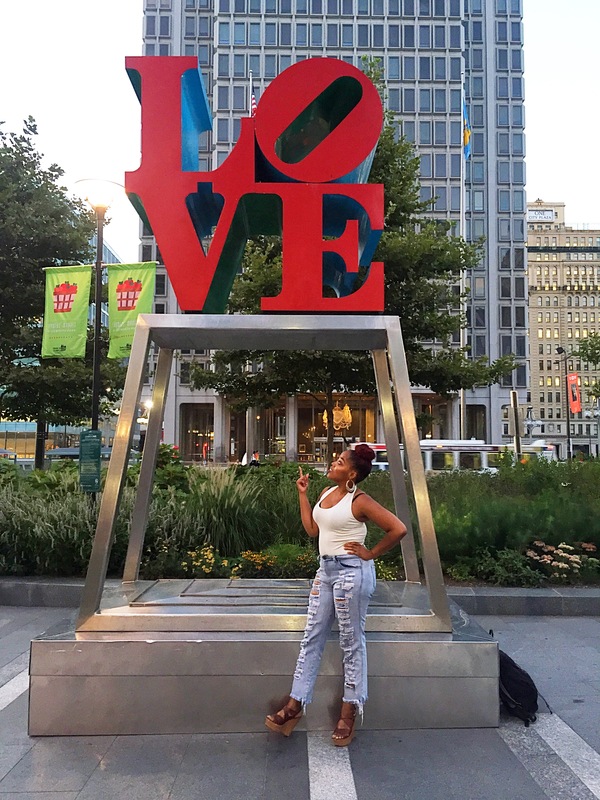 The sculpture was created by artist Robert Indiana in 1978. I was so excited to see such an attraction, and there was a short, but quickly moving line of people waiting to take photos in front of the sculpture. Seeing this sculpture had me thinking and inspired my thoughts of how simple and easy of a solution, using LOVE to solve all of our problems in life and in the world would be. Many believe Love is where all religion was derived, love is the first emotion you feel when you are born, it’s the first emotion when you see your child born or any child born into the world. Some believe in love at first sight. Well wouldn’t that be true for everyone if Love is the purest and simplest emotion? Aren’t we all in love with one another essentially. Love is what stops us from hurting others, love is what makes us stop and give money to a homeless person on the street even if we don’t have much to give, love is what moves us in a positive direction in our lives, love inspires us to do good, love keeps us smiling, keeps us happy, love helps to keep us motivated in times of despair, love is just awesome! I believe love is the easiest emotion to feel, and to show. Showing hate and jealousy is more difficult because it doesn’t feel good internally. Love feels good to the giver and to the receiver so it’s just, easier. So regardless of the type of relationship the central feelings of intimacy, emotional connections, and closeness crosses all barriers of relationship types the same. I believe love is the glue that keeps relationships together and can often be what separates people for their own good. No wonder Love is the basis of most songs, movies, books, poems and so on. When my daughter draws a pictures for me at school 99% of the time its about love or the word love is scribbled there some where. Because for children love is so pure they don’t try to block it out when they feel it or have an urge to express it. It comes naturally and they have the ability to let it flow. As adults we are so tainted with the emotional scars of life we often block out the emotion of love when we have the urge to express it or we even block it from coming in. In the words of Kendrick Lamar “When are we going to understand that we are put here to love?”. Entertainment mogul PDiddy is also challenging the world to show more love with his new hashtag #Teamlove. Our ultimate soul’s purpose is to love. Yes, we are put here to teach, to make money, to learn, but underneath all of that, at the lowest common denominator, we are showing the emotion of love. With the teachings we are giving someone jewels that will help them which equates to love. Making money will help you to live a better life and if you have children like myself you are able to give them material things, and to provide an easier more comfortable life for them, which is also the expression of love. You enrich your minds because you love yourself and others enough to want to be the best you, you can possibly be and this equates to a form of love as well. If we smiled more, practiced more gratitude, exercised acts of kindness, and were just more loving, this world would be a better place. Living in it wouldn’t be difficult at all, I think the difficult part would then become the moment you’d have to depart for this material existence. Departing from such an over pouring of the ultimate emotion, would be one of the most difficult things if we were more loving to one another. Because as the old saying goes “LOVE conquers all”. I’ve recently been challenging myself to not block out love, I’ve challenged myself to acknowledge love when i see it, experience it or when someone shows it to me. I am also challenging myself to show more love to others. I challenge everyone out there to do the same. This world and our stay in it would become a better place.